Millikin officially broke ground on its new Center for Theatre & Dance during a ceremony held on May 18, 2018. 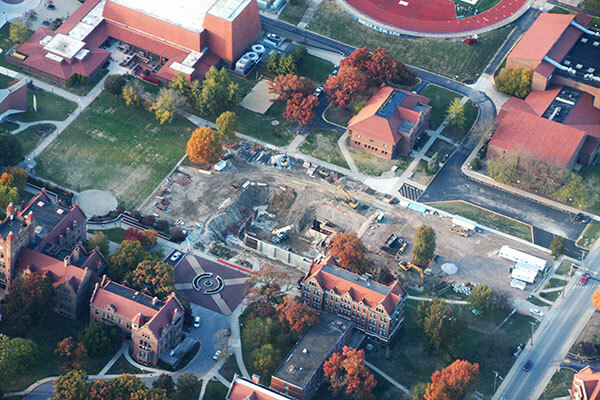 Construction is fully-underway with a goal of completion by fall 2020. 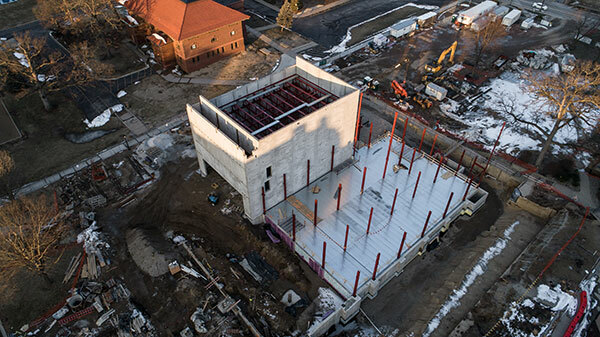 The new Center promises to be a centralized location for creativity to be cultivated, fostered, and displayed, and will also provide a new venue for Millikin performing arts to delight, inform, and inspire audiences. The $29 million project will feature a 260-seat flexible theatre which includes an orchestra pit, balcony, and tech gallery with a tension wire grid. The new building will also feature lighting and sound labs, a costume studio, a costume classroom, collaboration spaces, and offices and support facilities for current staff with room for growth. 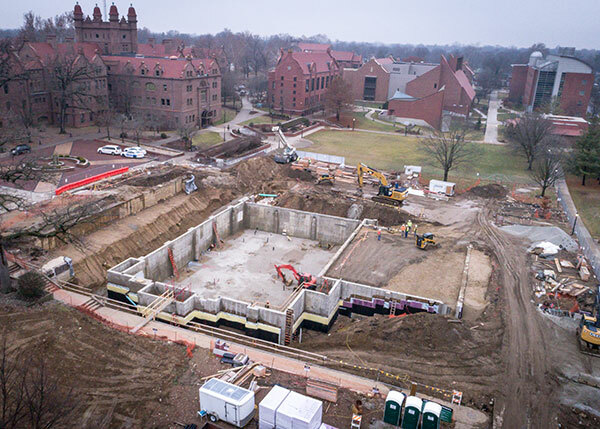 Located at the former site of the Richards Treat University Center, Millikin’s new Center for Theatre & Dance will also incorporate four acting studios, two dance studios, two design classrooms and practice rooms as well as all-new modern theatre equipment and LED lights. Gifts have been made to support fundraising efforts by our community of generous alumni, community leaders, and Board of Trustees. Fundraising efforts are ongoing, give now to help support the Center for Theatre and Dance. View the full Center for Theatre and Dance video playlist. Construction on the Center for Theatre and Dance is fully underway. BLDD Architects Inc. and CORE Construction are setting the stage for a revolutionary, transformational building rising from the site of the former Richards Treat University Center. Currently, the project is on schedule. Despite the poor weather, construction crews have been able to make up time in other areas to offset the areas where work was slowed. A significant amount of steel was delivered and installed in December and this allowed the basement to be enclosed and heated for the pouring of concrete slab. Pre-cast panels have been erected around the Center's theatre, and the remaining structural steel and trusses for that space are currently being installed. A crane will be shifted in the coming weeks to continue the steel frame installation. Millikin University officially broke ground on the new Center for Theatre and Dance during a ceremony held on May 18, 2018. The new building will feature a 260-seat flexible theatre which includes an orchestra pit, balcony and tech gallery with a tension wire grid. The Center will also feature lighting and sound labs, a costume studio, a costume classroom, collaboration spaces, and offices and support facilities for current staff and room for growth. Millikin's new Center for Theatre and Dance will also incorporate four acting studios, two dance studios, two design classrooms and practice rooms as well as all new modern theatre equipment and LED lights. With a goal of completion by fall 2020, the Center will offer a centralized, focused location for creativity to be taught, fostered and displayed, and will also provide a new venue for Millikin performing arts to delight, inform and inspire audiences from throughout the region. 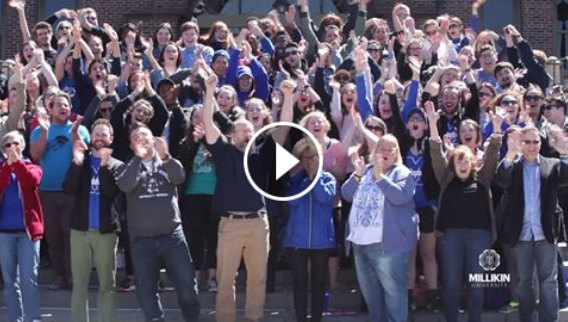 Be a part of Millikin's Momentum. It’s the end of a year. And the beginning of a new era. 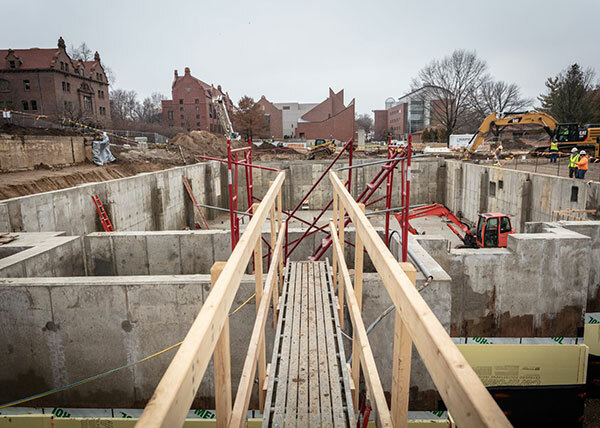 Millikin’s new Center for Theatre and Dance is coming into focus. As this revolutionary building will begin to resemble architectural renderings in 2019, the Center for Theatre and Dance promises new advancements for creativity to be taught, fostered, and displayed. Please consider a gift of lasting legacy. Contributions made on or before Dec. 31 qualify for a 2018 tax deduction. This is the moment. Millikin is the place. 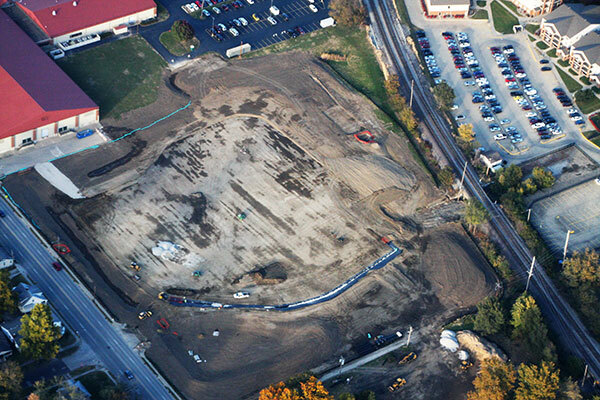 We’ve seen great progress on the construction for the Center for Theatre and Dance this fall. The first concrete was poured on Oct. 3, 2018. It’s exciting to see foundation walls take shape, as seen from images provided by Trustee Emeritus Dr. Steven Huss’ airplane. Join us on social media via Facebook (MillikinUniversity and MillikinTheatreandDance), Twitter and Instagram (MillikinU), and YouTube (MillikinUniversity) to see more progress and construction updates. Fundraising efforts are ongoing; make a gift today and be a part of building the foundation for the Center for Theatre and Dance. June 22, 2018: You Did It, Again! In May, we asked you to support the new Center for Theatre and Dance through the #BuildingOnDreams, Act II: I’m In! initiative. The goal: 250 donors in 2 days, May 16-18. 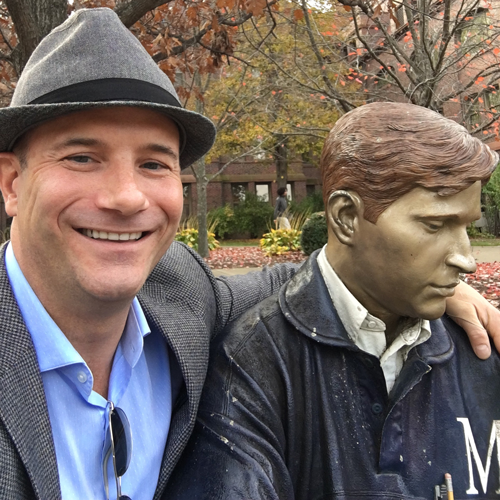 The result: We exceeded our goal of 250 donors, securing the generous $10,000 challenge gift from MU Trustee Eric Zollinger ’97! Thanks to all of you who helped make this happen for SOTAD! Your support of Millikin, the School of Theatre and Dance, and the new Center for Theatre and Dance is incredible. Together, our energy, love, and giving make the Center a reality for all of us. April 7, 2017: Bravo! Bravo! April 3-7, we asked School of Theatre and Dance alumni, students and friends to support the new Center for Theatre and Dance through the #buildingondreams project. The goal: 250 donors in just five days, April 3-7. The result: 344 of you rose to the call, meeting a $10,000 anonymous matching challenge in doing so – and donations are still coming in. Today the total stands at more than $62,000. Flat out amazing. THANK YOU! With your support, you made a strong statement about the critical need for a new building ASAP. And you clearly had some fun, as seen by the great response to the T&D faculty and staff video shenanigans of last week. TELL YOU WHAT: We'll keep it up if you'll keep it up! No more waiting ... with great enthusiasm I can share with you the news of the proposed Center of Theatre and Dance. In a re-imagination of the project, Millikin President Patrick White, Provost Jeff Aper, Dean Laura Ledford, along with the Theatre and Dance faculty, have selected an architect to work with us on the project. The proposed re-imagination is a newly constructed building incorporating changes in the industry, and the conceptual designs have been approved by T&D faculty as meeting the needs for a growing School of Theatre and Dance. How exciting for a “NEW” building versus plans that repurpose existing space. 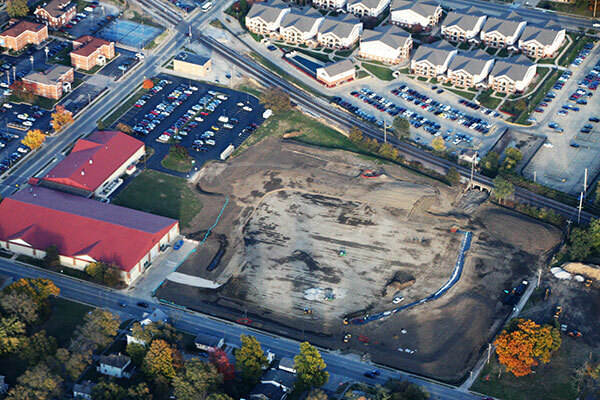 Millikin will finally have the facilities that match the caliber of education it provides. It is no secret this has been a dream for past and current students for many years, which is why I believe fitting for this to be branded the Building On Dreams initiative. The above renderings are part of the initial proposal capturing the Millikin architecture aesthetic and amount of space needed. 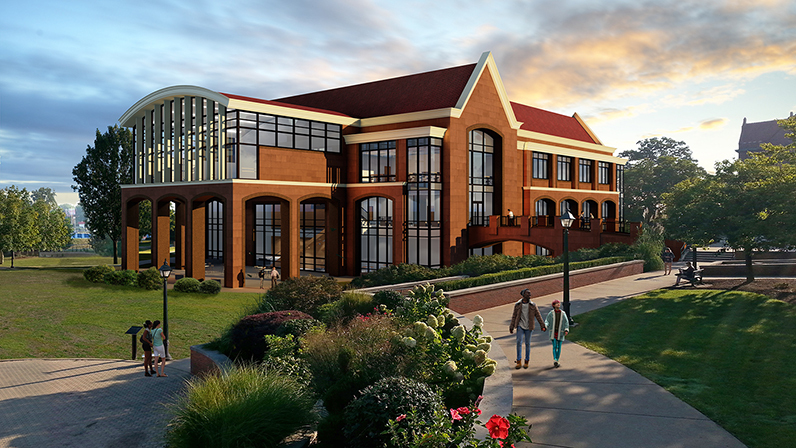 This project is moving forward thanks to the Millikin alumni, friends and faculty/staff who have already committed more than $11 million to this project. We estimate the entire project can be completed for approximately $25 million. We will be pursuing major gifts from corporations, foundations, and other philanthropic individuals and organizations. Starting April 3, we embark on the first Building on Dreams Initiative Challenge Week. We need to demonstrate the desire and support for this new project. Our goal is 250 donations from Millikin alumni and friends between April 3-7. It doesn’t matter the amount – the goal here is number of donors. This is our institution’s legacy; YOU are a part of that rich tradition and heritage! Social Media: Spread the word about this campaign to your friends and fellow alumni. Make a Gift: Every gift is important (e.g., $25, $50, $100, $10K!) and will get us closer to the goal. Feel free to donate now. The percentage of alumni donors, as well as the amount given, helps us to leverage bigger gifts. It will be a powerful message if we gain support from a high percentage of our School of Theatre and Dance alumni. Make a one-time or recurring gift now. All gifts are tax-deductible! Make a Connection: Do you know of a foundation or philanthropic business interested in supporting worthwhile capital projects? Do you work for a company that offers matches for charitable giving? Check with your employer and/or contact Mandi Podeschi ’02, senior director of development at apodeschi@millikin.edu with questions, ideas, or matching gift notification. Refer a Student: Millikin wants to continue attracting quality students for its internationally acclaimed T&D program and for Performance Learning in majors across the institution. Stay in touch! Tell us your stories. Your successes make up our best arguments for raising support for the Center for Theatre and Dance, whatever your career. How did your Millikin experience prepare you for the path you are forging? A Theatre and Dance Advisory Council has been created. This group of Millikin alumni, friends, trustees and faculty/staff will assist in communicating about the new building and consider ways to involve our alumni, friends and community in the process. Your participation is needed and appreciated! We welcome your engagement in the process and ownership of seeing this plan through fruition. As a T&D alumnus, your representative on the Board of Trustees, and chair of the new Theatre and Dance Advisory Council, I want to make sure your voice is heard. If you have any questions, concerns or thoughts, please feel free to contact me at ericznyc@mac.com or 917.763.9079.